“Manager’s Special” is on the menu at my daughter’s school today. What that really means is the cafeteria is cleaning up for the summer and is serving anything they have left in the refrigerator. I don’t like to eat the clean-out-the-refrigerator meal in my own house, so I certainly would not want to eat it at school. Since I am already on summer break, and my daughter is not, we overslept this morning. I sent her to school without a lunch and promised I would bring something to her. I figured my daughter’s teachers did not want the Manager’s Special either, so I packed a lunch for everybody. Consider it a final little teacher gift for the year. As a reminder, teachers are stuck in the school building all day. Unless you hire a sub, there is no leaving the building to grab a sandwich. If you are looking for an easy, low cost end of the year teacher gift, consider bringing a tasty lunch. 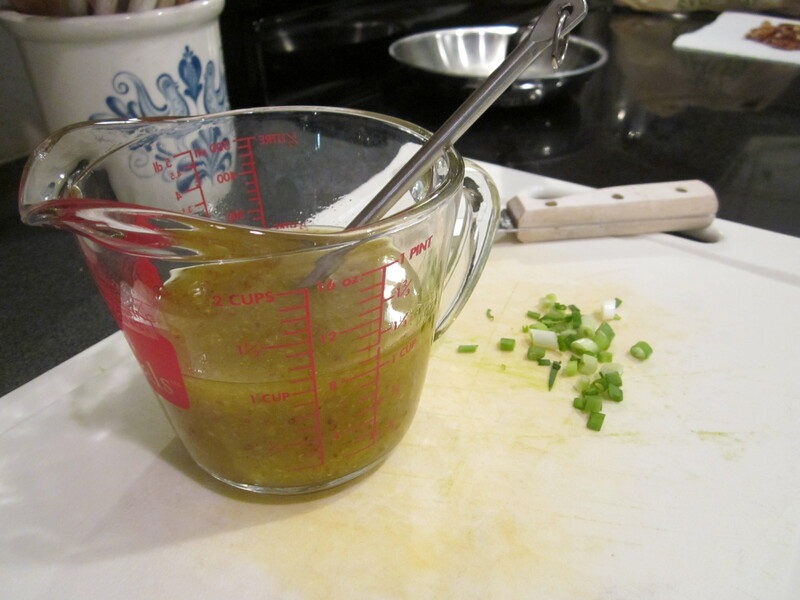 Prepare dressing by combining vinegar, honey, lemon juice, mustard, salt and pepper. Gradually whisk in oils until well blended. Place lettuce greens in a large bowl. Toss with enough dressing to coat. Sprinkle apples, cheese, green onion, and pecans over the top. Cut chicken strips crosswise into 1/2 inch pieces. Arrange on top of salad. Drizzle with remaining dressing if needed. In order to keep the apples from browning, toss the apples in a little lemon juice before sprinkling on the salad. 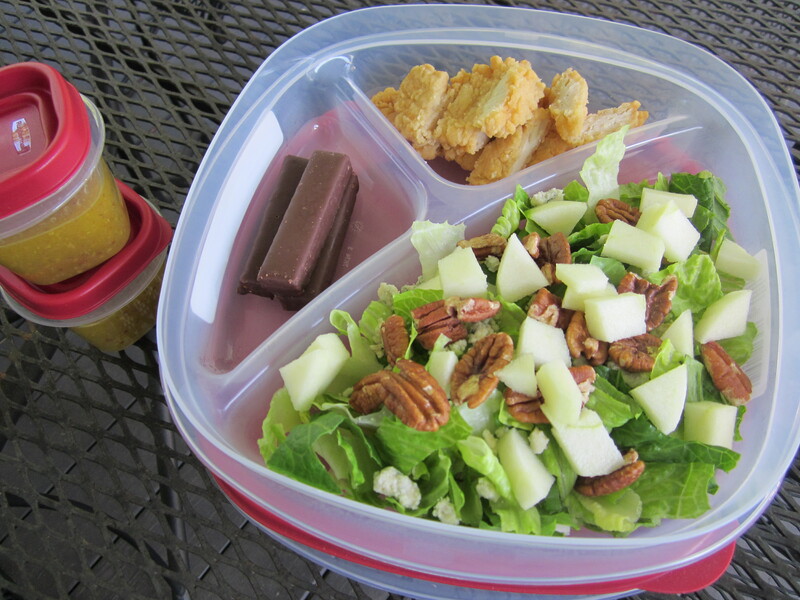 If making for a school or work lunch, compose the salad but keep the dressing in a little container on the side. I like to keep the chicken strip pieces on the side too. Do not add dressing until ready to eat and then top with the chicken strips. If I have the option, I always use Publix fried chicken tenders. When we lived in New Orleans, I used Popeye’s fried chicken tenders. If you do not have a Publix or Popeye’s in your area, I find that most local grocery stores usually have superior fried chicken tenders to other fast food restaurants. Chik-fil-a tenders do not really work for this salad because their coating is a little different than a straight up fried chicken strip. This salad is great for baby showers, picnics, luncheons, and summer dinners! I delivered the teacher salads and my daughter’s lunch a little before 10 am this morning. 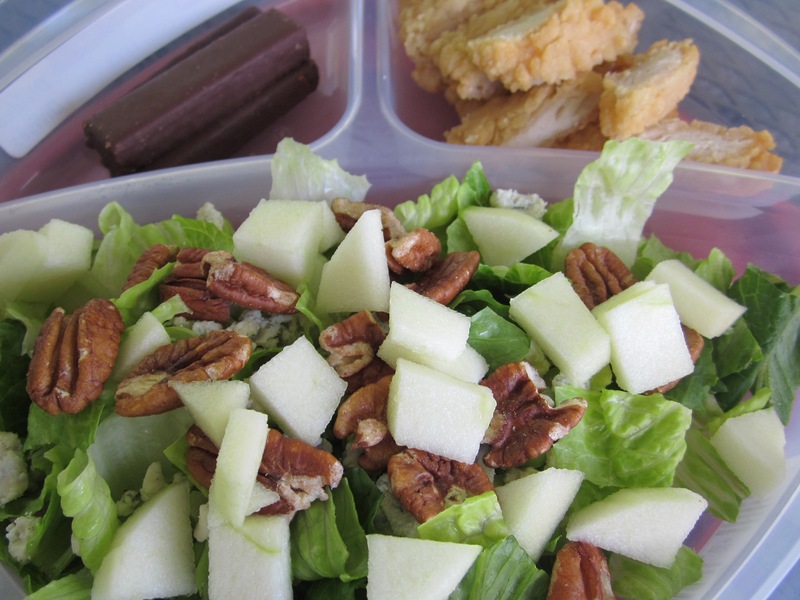 My daughter had a decomposed salad in her lunch box (chicken strip bites in one container, apple slices in another container…). 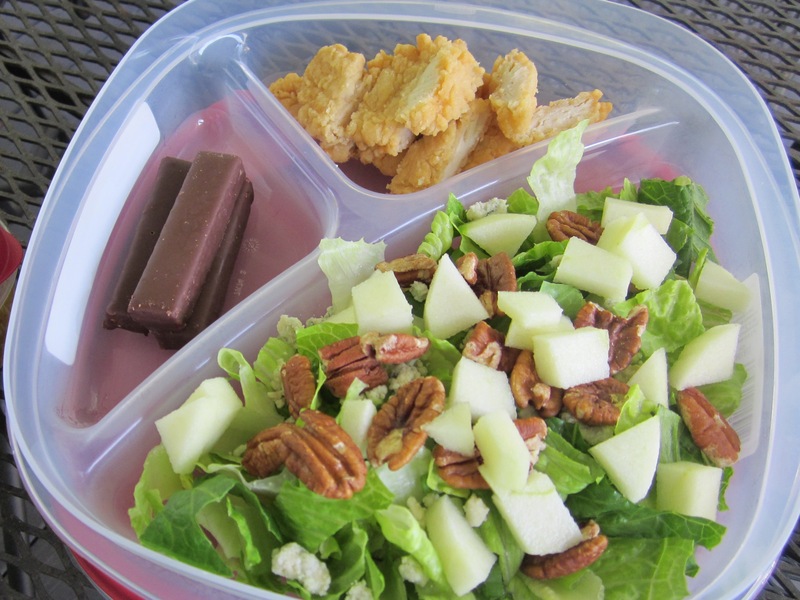 The teachers received their salads in a bento style tupperware that they get to keep– cookies included.